Own a replica of a historical Millstadt church! Zion Church’s Sisters in Faith commissioned Cat’s Meow Village to create a replica of their church building as a wooden shelf sitter. If you are interested in Millstadt history or have friends or relatives that are/were Zion members, this would make a unique keepsake. The purchase price for one of these shelf sitters is $20 and can be purchased at the Church office. Shown below is the front view of the shelf sitter. On the back of the shelf sitter is printed the following history of Zion Church. Zion Church held its first service on Jan. 17, 1835, led by Pastor John Jacob Riess in the Freivogel home located 1.5 miles outside Millstadt, IL. The first church, a log cabin style building, was erected in 1837. 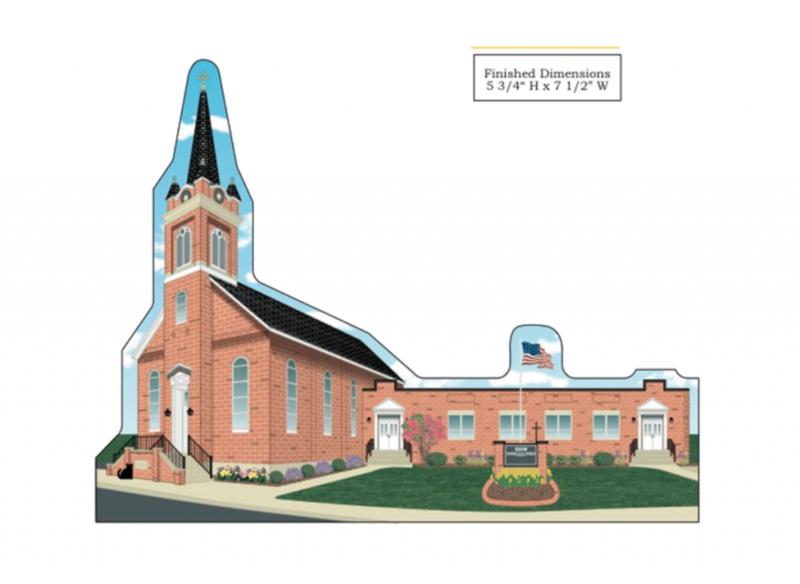 In 1850 the congregation moved to a new brick church on West White Street in the village of Millstadt and held services there until 1863, when the current Zion Church, a colonial style brick building, was erected. On Nov. 18, 1956, the educational building was dedicated. This artwork, sponsored by the Sisters in Faith, hopes to showcase Zion’s rich heritage and her strong commitment to worship God, share Christ’s love, and minister in Millstadt and around the world. M-Th 8:30am – 3:30 p.m.